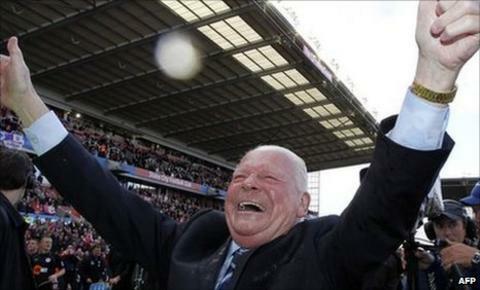 Dave Whelan has stated he would pull Wigan out of the Premier League if promotion and relegation were scrapped. On Monday, League Managers Association chief executive Richard Bevan said some American and Asian owners of top-flight sides were keen on a franchising model. "If it was to happen I would resign Wigan from the Premier League and go back and play in the Football League," the Wigan chairman told talkSPORT. "It's the most stupid suggestion I've ever heard in my life." The idea has also been described as "suicide" by Manchester United manager Sir Alex Ferguson. For Premier League promotion and relegation to be abolished, two thirds of the league's clubs would have to vote in favour of the move. The league's rules say Football Association permission would also be required. Whelan said: "It's a worrying thought that if we get 14 or 15 foreign owners [in the Premier League], they come up with some mad idea and it gets voted through. "It's got to be competitive, every club has got to have that ambition to get to the Premier League, that's why our league is so good. It's an appalling suggestion. It would ruin and kill English football." It is the second time inside a week that Whelan has revealed strong opposition to a suggestion for a major change to the Premier League. He said Liverpool managing director Ian Ayre's call for clubs to be able to sell their own overseas television rights would "kill half the Premier League". Ferguson said he was opposed to the idea: "I don't see where the end product comes in. An FA spokesman said it had to approve any major rule change, adding: "This covers changes to promotion and relegation."